Extended DISC® is a suite of validated online DISC assessments, also known as DISC personality tests. Extended DISC® is easy to administer and facilitate. Our acclaimed support and training materials combined with the best facilitator support in the industry ensure you will be comfortable and confident using Extended DISC® assessments. The tailored and pragmatic assessments are specifically designed to help your employees to modify their behaviors to become more successful. Our focus is on improving the success of individuals, teams and organizations. The process is simple and convenient. First, contact us to set up your DISC account. Once we set you up, simply email an invite to your respondents. We will provide you with an email that contains an Access Code and link to our secure assessment website to take the DISC assessment. That’s it! The respondents can complete the DISC questionnaire 24/7 on their computers, tablets or mobile devices. The questionnaire takes only 10 minutes to complete. It is available in over 70 languages. As you know, it is critical that the respondents can answer the DISC questionnaire in their native language. Otherwise, the results are simply not valid. Once a person completes the DISC assessment, the DISC profile results are emailed right away. Results can also be sent to more than one person including facilitators, administrators, respondents, and managers. How Are the DISC Reports Provided? Our clients find it important that they can choose the format the DISC results are provided. They can customize the reports for their preferences to provide the most relevant and user-friendly assessments. You do not have to choose from a few DISC report formats. Unlike other DISC assessments, Extended DISC® measures individuals’ natural, hard-wired behavioral style. This style remains quite stable over our adult lifetime. Extended DISC® focuses on the hard-wired DISC style because it provides the most accurate starting point for training and development. If an assessment tool does not measure it, the starting point for development is obviously misguided. When the starting point for behavioral change is not accurate, one cannot successfully modify behaviors. Your participants will appreciate the fact that the DISC model is completely non-judgmental. There is no best DISC style. In fact, it is important to emphasize that we should not try to change others. The focus is to help individuals to modify their behaviors to become more successful. The DISC results provide very practical and specific information to guide behavioral modification, but it should never be a sole reason for making decisions about a person. While it’s sometimes called a personality assessment, it does not measure a complete aspect of one’s personality. All of us are a combination of all four DISC profile types. DISC assessments are based on the DISC model. Again, not all DISC tools are the same. Traditionally, DISC tools that measure conscious style. However, this style changes depending on our environment. As a result, there is no so-called test-retest validity and the starting point for development is not accurate or worse, very ill advised. Extended DISC® measures both the hard-wired and adjusted DISC styles. Extended DISC® has its main focus on the hard-wired DISC style because it obviously provides the most accurate starting point for development. However, it also identifies the adjusted style to help employees consider if their DISC style adjustments are appropriate for their present objectives. Also, Extended DISC® has over 200,000,000 unique DISC results to ensure employees receive very personalized and specific results. One of the first things Extended DISC® users tend to review are the DISC Profiles. 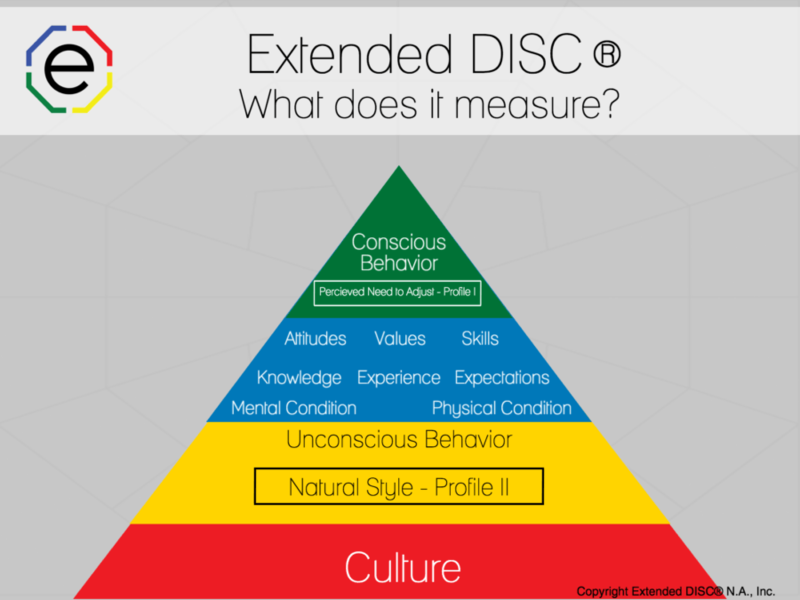 Learn more about Understanding your DISC profile. Your natural DISC style is your unconscious, hard-wired behavior style. This DISC style requires the least amount of energy and is the least stressful. Your natural style remains fairly stable, but not rigid, over your adult lifetime. 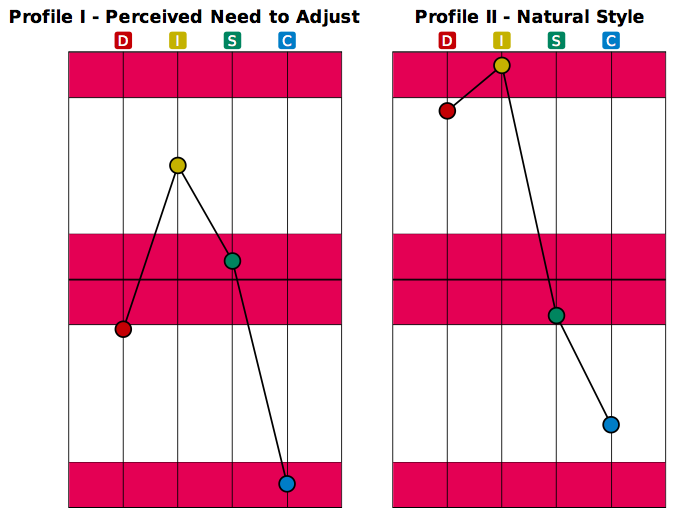 Your Profile I – Perceived Need to Adjust graph is above on the left. Your adjusted style shows how you perceive you need to adapt your natural DISC style in order to become more successful at the present time. We provide support and training to make it very easy to interpret the DISC profiles. Our DISC Assessments are built on the practical and effective 4 Steps to Effective Behavior Modification. This makes it easy for DISC facilitators to create and deliver successful DISC workshops and coaching sessions. More importantly, this makes it easy for employees to apply what they have learned and begin to modify behaviors to become more successful. We provide customizable DISC reports to fit the needs of your diverse clientele. They use Extended DISC® assessments that are most relevant and accessible to their employees. In addition to receiving individuals’ DISC reports, you can also combine the results into DISC Team/Group assessments. There is no additional cost to create a Team Assessment and the participants do not have complete additional DISC test. Team members, managers, and leaders can use the team report to assess the team to easily identify gaps and strengths of the team. 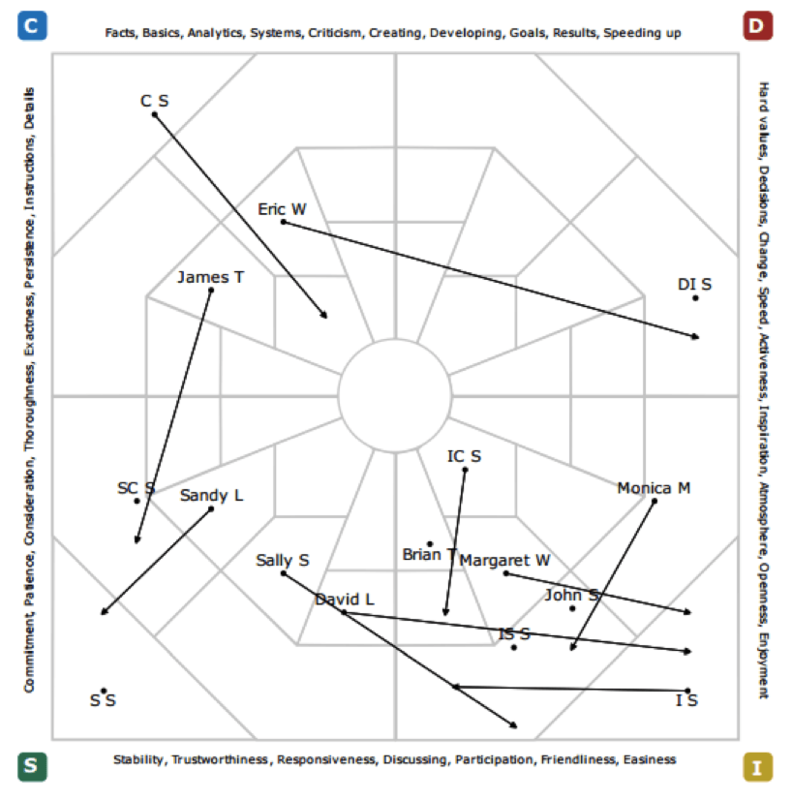 The Team Maps are easy to understand, visual tools that provide insight into team dynamics. Our clients use Team Assessments to improve communication, team productivity and to make informed, useful changes toward resolving possible conflicts. 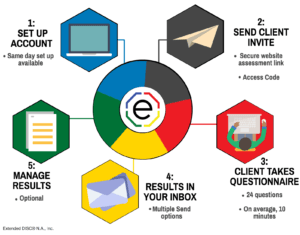 In addition to tailored DISC assessments, you can to DISC admin site to manage your assessments 24/7 to reorder reports, create team reports, customize reports, and more. You can also have access to the Executive Dashboard, an incredibly powerful, real-time organizational development tool. You can view your DISC data in the context of teams, departments, and even companies. Do you have a high turnover rate in your company? Are there certain DISC styles that tend to leave? Do you have groups that perform at a higher level than the rest? What’s the group’s DISC style? The more information you have, including using DISC profiles, the more likely you will have answers to make better decisions. DISC is vital in that it offers a way to better know your employees. 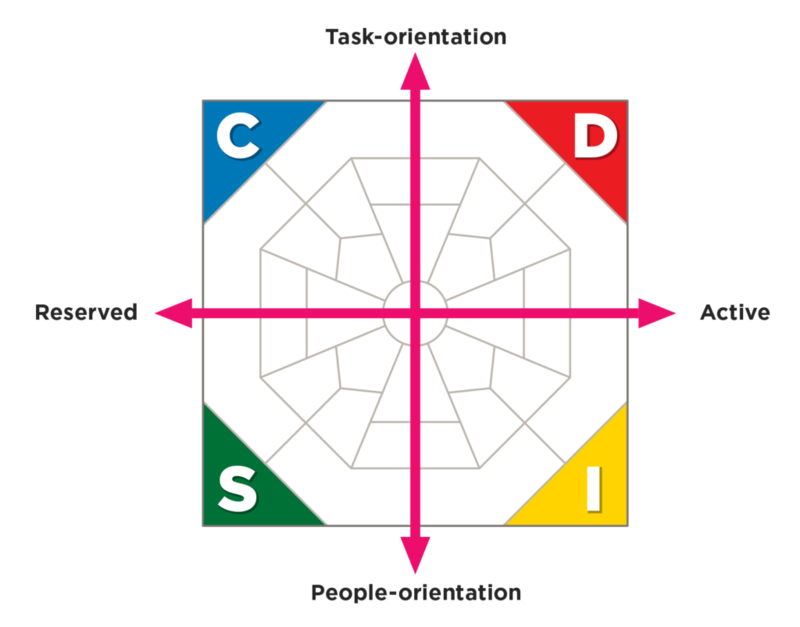 DISC profiles can be a valuable tool when it comes to placing a person in a certain role or pulling together a team. In addition, managers may understand why their team seems to have so trouble working together. Maybe something as simple as changing a few people around on different teams would be enough to make the department more effective. Our assessments are validated and revalidated around the world. We are committed to provide accurate DISC assessments. One of the unquestionable strengths of Extended DISC® Assessments is that we will not produce a DISC report if we cannot clearly identify a person’s DISC style. We never provide results unless the results are valid. We are committed to making DISC facilitators successful. Our DISC training options give you the confidence to help people and organization to develop. You will learn to unlock the full potential of the DISC tools. You are not required to become Certified but it is recommended. We offer virtual, public and onsite certification. We provide flexible pricing options fit your needs and budget. While we provide DISC assessments on a per person basis, our Unlimited Use License is the best choice for many clients. It provides you with an unlimited use of DISC Assessments for a fixed fee. Hence, it’s easy to stay within budget and you do not have to worry about paying for every assessment you use. The history of DISC began in the early 1920s. Our Extended DISC tool has been around since 1994, but it took years of research and groundwork to develop a powerful DISC tool. We stand behind our DISC tool. In order to maintain our high standards, we use the University of Oulu to validate our tool on a regular basis. One of the strengths of our DISC Assessments is that we will not produce a report if we cannot clearly identify a person’s DISC style. We never generate results unless the results are clearly valid. You don’t want results that could be misleading. This situation is called an “invalid profile”. There are different reasons for invalid results, including overthinking, second-guessing, rushing, distraction, etc. The underlying reason for an invalid profile is that the person did not respond consistently to the 24 questions. As a result, it is not possible to identify the person’s style. Join our expanding group of highly successful coaches and consultants worldwide. Our DISC training options give you the confidence to help people and businesses grow. Learn to unlock the full potential of the DISC tools and system with training in the DISC. You are not required to become certified but it is recommended. We offer virtual, public and onsite certification. When you become an authorized affiliate you have access to the best pricing and support in the industry. You may also find our Unlimited Use License to be a great value and asset to your company. You would have unlimited use of DISC Assessments for a fixed fee. Hence, it’s easy to stay within budget and you do not have to worry about paying for every assessment you use.